ProductBio is an early stage startup looking to help organizations buy more sustainably by harnessing its database of ecolabels and criteria. I spent a summer interning under their product designer assisting with visual design, user testing, prototyping, and website redesign. To provide context for myself and the team on our target audience, I perused through former user testing session notes to glean insights on the wants and needs of our prospective users. These personas were updated as we conducted more user interviews. One of my very first tasks was to create a graphic that would demonstrate the depth of the data we had. I did some research looking at data visualizations and settled on a bloom visualization. Working closely with marketing and business development, I came up with a graphic that showed the relationships between potential users, our data, and products. To make it more interactive, I made a gif version that highlights each node group in the relationship. homepage and solution pages based on the trends I saw. 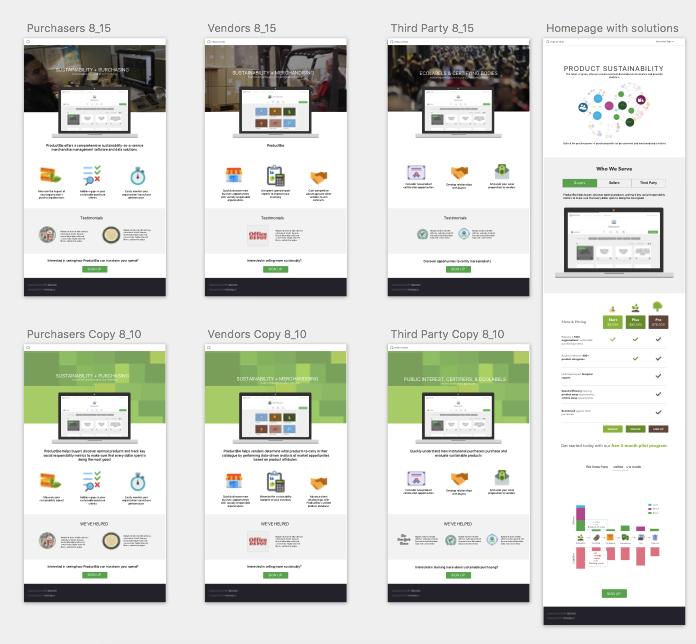 I then turned these into higher fidelity mockups and iterated based off feedback during design reviews. We were targeting several different types of users and our solution pages were an effort to gear people towards how they might use our product. Our three main groups were Purchasers, Vendors and Third Party. 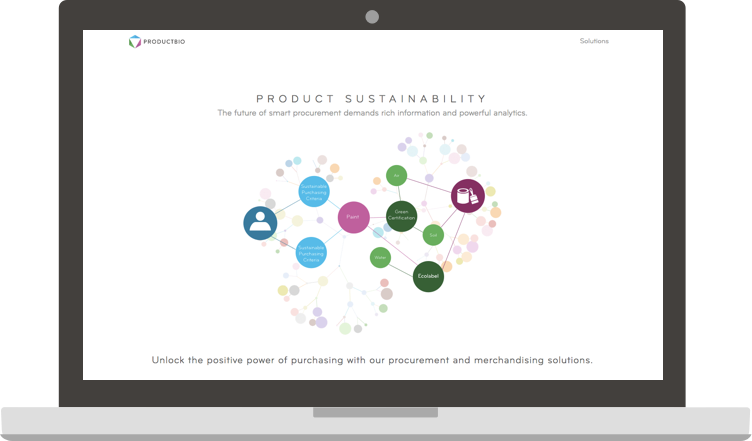 Our application sought to create a dashboard of visualizations to help the user determine which parts of the spending they could focus on improving in terms of sustainability. We researched dashboards and used a Pinterest board to collect our inspirations. 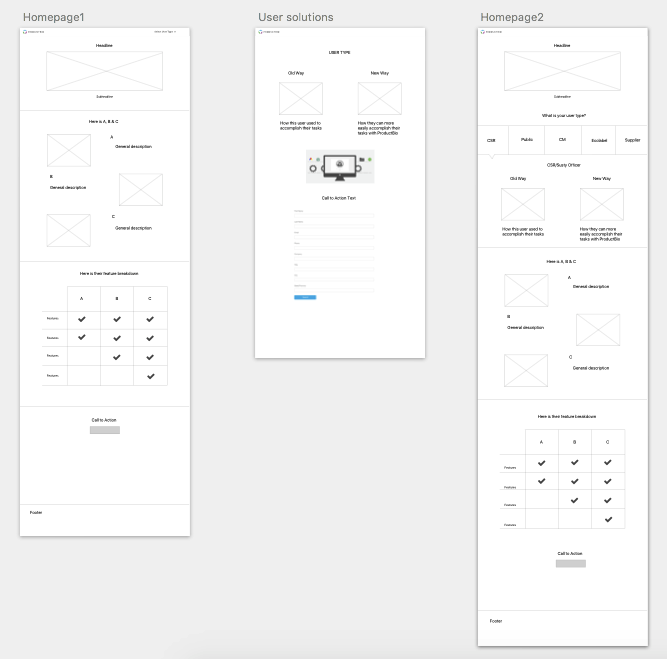 I sketched out several potential flows that would allow the user to drill down from the dashboard view to the product category view. I worked on the onboarding flow for the application. 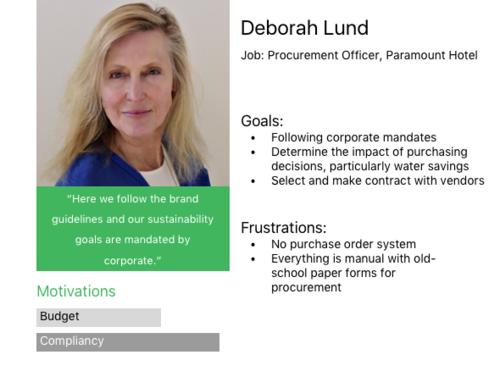 It involved making sure that the user selected their organization type, created a log in, and uploaded the appropriate documents to begin setting up their dashboard. Towards the conclusion of my internship, I requested to try out animation prototyping and thus used Principal to work on a Account Settings flow where the user could update their personal profile and choose to upgrade their plan. Both these flows were created in Principal and due to NDA reasons, unavailable for public view. It was an interesting experience working in an early-stage startup with a small team. My manager and I acted like a small consultancy within the company to do full-cycle design. 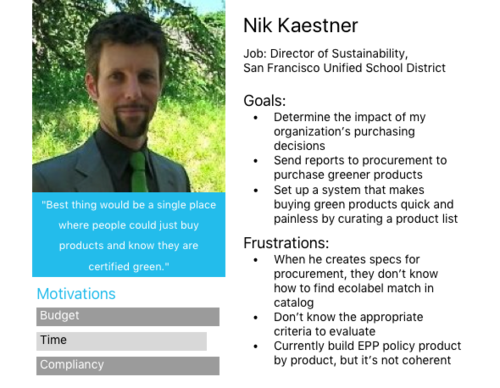 I learned to do a more formalized user research and interview process with the opportunity to see how an actual sustainability office would use our application.